Circuit simulator is still a work in progress, plagued by disease and other unfortunate circumstances. By deciding what our architecture is going to be, we will know exactly what we need to build and how we need to connect them. We have welcomed a couple additional people onto this project. User 7H3_H4CK3R has participated in most of the architectural design decisions featured on this page, and user Mego has taken over work on the circuit simulator. As mentioned previously, we will be using an asynchronous design to speed up our processor. We will accomplish this by having a clock signal accompany the data everywhere it goes. This clock signal will serve as both read and write signals for the various memory devices (ROM, RAM, synchronizers, etc.). We could use a Transport Triggered Architecture (TTA), in which case instruction would be of the form (source, destination). We would hard-wire a lot of addresses to perform specific operations upon reading/writing, similar to the Wireworld computer. We could have created a distinction between registers and RAM, and we could have an accumulator. Then we could have load/store commands to transfer between them. Then we could have instructions of the form (opcode, value) that could either load a certain RAM address, store a certain RAM address, or perform math, such as adding a given register to the accumulator. We could choose to not have registers, and just use RAM for everything. Instructions would be of the form (opcode, value, value). We could either move between RAM addresses (one of which would be mapped to the program counter), or perform math in which the result would be stored in a hard-wired default RAM address (which would act like an accumulator). We could avoid having a default RAM address by having instructions of the form (opcode, value, value, destination) so that a destination could be assigned to every result. This could also allow for stuff such as conditional moves. We chose the fourth option because, the more detailed the instructions were, the fewer instructions we need, which I believe will speed up execution. Take an example of adding two numbers from RAM and storing the result in RAM. With TTA, that would require three moves (for the two operands and the result). With the third option, it might take two (add arguments, then move result) or three instructions (load arguments, store result). With the fourth option, it takes only one. The fact that everything will be memory-mapped to RAM (including the PC), and that there are no special registers, make this design relatively simple. It is beneficial to have several addressing modes for operands of each instruction. Our modes just involve sending the data through the RAM read cycle the desired number of times, which means they are easy to implement. These addressing modes take on slightly different meanings when used as a value (first two arguments of an instruction) or as a destination (the third argument), but the hardware is exactly the same. Mode 0 is any constant hardcoded into ROM. This can be either a hardcoded value, such as an instruction that always adds 5 or always writes 17, or it can be a hardcoded destination, such as an instruction that always writes to address 42. Mode 1 is any value that results from a single read of RAM. This would be used when we desire to add the value in RAM address 13, or if we need to read the value of address 37 to determine where our destination is. Mode 2 represents dereferencing. If address 7 contains a pointer to the address in which our data is stored, we would use 7 as an address to read from RAM, use that data as an address to read from RAM again, and use that data as an operand in our ALU. Mode 3 might not be used (or might not even exist, once we actually build it), but it would act as super-dereferencing. This might be useful for 2D arrays. We have decided that 16-bit words are sufficient for our data, which will allow us to store values in the range 0 to 65535 for addressing or values -32768 to 32767 for numeric data using 2’s complement. Opcodes will probably be 4 bits, allowing for 16 instructions. Addressing modes will be 2 bits. This means that each instruction will be 4+2+16+2+16+2+16 = 58 bits long. The address of the next instruction leaves the program counter, immediately after which the program counter is incremented. This post-increment allows for “jumps” to point directly towards the desired jump destination, rather than the instruction immediately prior to it. The instruction address is sent to the ROM and the instruction is retrieved. The instruction is split into its parts, being (opcode, mode, value, mode, value, mode, destination). The opcode is stored in synchronizers until the data is ready. Each of the three arguments undergoes the following process. The mode and value (or destination) are sent to a counter. If the counter equals zero, the current value is final, so send it to the synchronizer(s) in the next steps in the process. Else, send the value to the read queue*, and decrement the counter. The read queue then reads the data from RAM using the value as the address, and sends the new data back to the counter. The counter cycles back to sub-step 2 above. Once the opcode and two values are available, the opcode is used in a selector for the ALU. It selects which basic operation to perform, sending the clock signal along one of many possible paths. The ALU returns a result. The conditional is evaluated to determine if the data should be written. For most opcodes (like ADD, OR, etc.) the conditional is automatically true. For special conditional commands, the first value is tested in one of two manners. We currently plan on having “val < 0” (sign bit) and “val != 0” tests. If the conditional is false, return to step 1 for the next instruction. Else, move the result to the write synchronizer, which also contains the desired write address from the end of step 3 above. The data is written, and we return to step 1. *The read queue is one of the more “magical” components where I don’t really know how/if it will work. Ideally, it would do some parallelization between the three values. Worst-case scenario is that it ends up being incredibly inefficient without parellelization. In order to speed up our processor, we will do a little bit of pipelining. In order for the computer to function nicely, we have to wait until after an instruction has written to RAM for the next instruction to read from RAM. It is possible do some overlapping, so that one instruction is being retrieved from ROM while another is being processed. This eliminates the delay that would be caused by having a program that is several thousand instructions long. On the other hand, this creates a branch delay slot, where the instruction immediately after a jump is executed regardless of the jump. 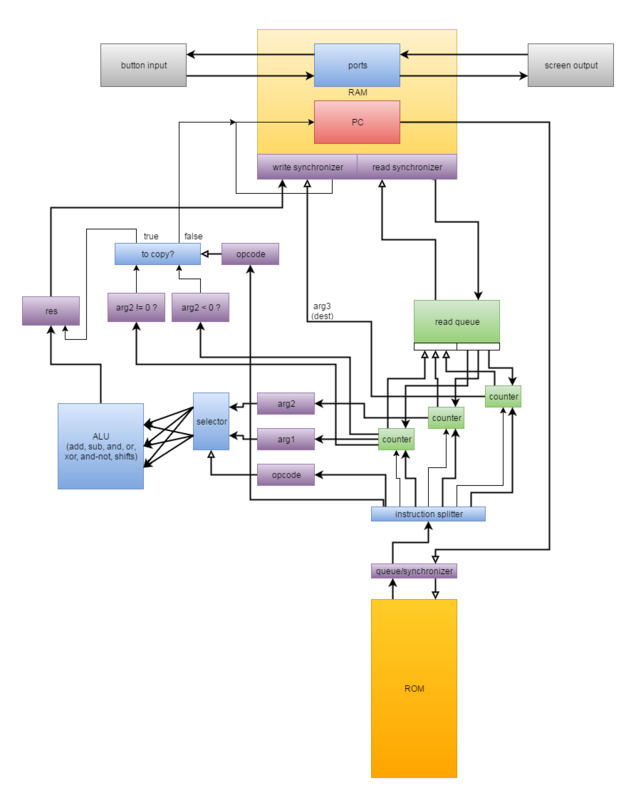 A rough diagram of our architecture, drawn with draw.io. Processors are as slow as their slowest component. While true in conventional CPUs, that phrase takes on a whole new meaning in cellular automata. At any given moment, there are lots of little pieces of data flowing around in our computer, and in order for two pieces to properly interact, the selected pieces of data must be perfectly in sync with each other. In the previous post, I mentioned the choice between constant- and variable-timed ROM. That is actually a small part of a large decision: synchronous or asynchronous? Synchronous: All of the data in the computer is kept in sync simply through wiring. All reads/writes have equal time, and all operations have equal time. Everything is as slow as the worst-case scenario (reading from furthest address, etc.). We don’t need to design any parts that can handle inputs at variable times, but we’ll need lots of delay wire to sync stuff up. Asynchronous: The next instruction is executed as soon as the current one is finished. ROM/RAM data is available as soon as it is read, with smaller addresses being faster. Arithmetic is performed once both operands are available. We can make circuits shorter/faster, but need components that are capable of synchronizing pieces of data with each other, such as holding the data for some arbitrary amount of time until it is ready to be used. An asynchronous design has the potential to cut average ROM/RAM access times in half. Given that the ROM may be several thousand tiles long, this will cut several thousand generations off each instruction’s execution time. Furthermore, it will reduce the complexity of wiring. This is why we have chosen the asynchronous paradigm for our processor. The current plan to implement asynchronous computing is to have a second wire running parallel to each data wire. This wire will carry a “clock signal” that indicates the presence of data. For example, this clock signal will serve as the read/write signals to memory. The clock signal will always remain in sync with the data, but the path (and duration) of travel can vary between instructions. The computer will speed up when small addresses are being accessed, and will slow down for larger addresses. There are, however, many times where two pieces of data must be put in sync with each other. This can work by storing one piece in a temporary “register,” which is read from when the second piece of data arrives. In order for an asynchronous design to work, this synchronization device has to be able to handle the two pieces of data coming in at any time (in practice, any multiple of 11 with some minimum separation between writing and reading). Here’s how our synchronizer works: first, the incoming signal is sent through a serial-to-parallel converter, which works similarly to one in our ROM. It’s actually a more “true” converter: the data signal is sent down a sequence of wire splitters separated by delays, and then the “clock signal” passes across each wire and selects a single bit for each of the outgoing wires. An example memory loop, with data-in (Di), write (S), read (R), and data-out (Do). 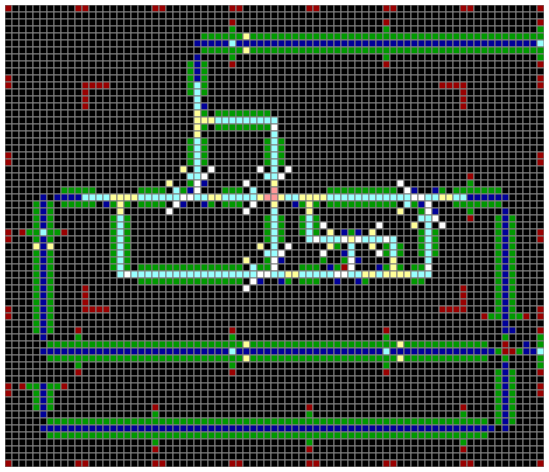 An AND-NOT gate that uses the write signal to destroy the information currently in the loop (which will happen in about 15 generation in this sim). An OR gate which which adds the new data to the loop. A wire splitter that repeatedly outputs the data stored in the loop. An AND gate that is hooked up the the read signal to allow the data to exit the device (which will also happen in this sim). In the synchronizer, the loop must be able to be read from at any given time (multiple of 11). So, we must have four electrons flowing around the loop to signify an “ON” bit. This means that the input bit (and write signal) must be tranformed into four bits in quick succession. My method for this is duplicate the signal twice: first by splitting the signal, delay one copy by 11 ticks, and joining them. Second, we split the signal, delay by 22 ticks, and join them. The more difficult operation is the delay by 11 ticks. I decided to create a special component to accomplish this operation. Signal “doubler”: splits the signal, delays one copy by 11 ticks, and merges them together. It is probably possible to replace the OR with AND/XOR if desired. The second doubling is simpler: we split the wire and merge it using our typical components. 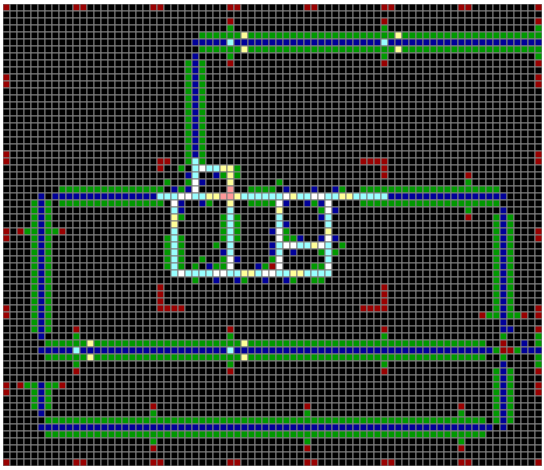 This can be done in a 2×2 tile space, which there is probably little benefit in compressing. Once each of the bits (and write signal) have been amplified 4X, they are used to load the loops. The “ON” loops will emit a pulse every 11 ticks, with the “OFF” loops emitting nothing. Reading from the device requires two things to happen. First, the read signal travels across every output, using the same AND/Crossing multi-tile to select one electron from each loop. These electrons are then merged into a serial data stream, using OR gates separated by delay wire. The output electrons are in the same order as they were input. Below is a synchronizer I constructed in VarLife. The serial-to-parallel converter is in columns 1 through 3. Column 5 has the 11-tick doubler, and columns 6 and 7 have the 22-tick doubler. Column 8 contains allows the write signal to reach each loop, with the loops themselves in columns 9 and 10. In columns 11 and 12, the read signal selects one bit from each loop. Finally, column 13 has the parallel-to-serial converter. A sample 2-bit synchronizer. it’s actually 1 tile wider than necessary, with the serial-to-parallel converter separated from the rest of the device. As shown, it is about to store the number 3. Storing one input for the ALU (arithmetic and logic unit) while the other is being retrieved from memory. Storing the RAM address so that it can be synchronized with the larger data loops (probably 32 bits with 22-tick separation) of the RAM, so that data can be read and written at the correct starting and stopping points. Pipelining/queuing: Putting one piece of data on hold while another one is using the device (probably ROM, maybe also RAM). Something to keep track of whether or not new data is present. By this, I mean whether or not data has been written since the last read. In the case of RAM, something that blocks the read signal if new data isn’t present and waits until the next loop cycle to try again. In pipelining/queuing, something that marks the device as being “in use” or not. If the device is not in use, the write signal also serves as the read signal, so that the data may pass through (almost) immediately. If the device is in use, it waits until the other data exits the device, and uses that data’s clock signal as the read signal. The bulk of the program for the computer will be stored in ROM, or Read-Only Memory. We chose to use ROM because it tends to be more compact than RAM, and the speed of memory access will be one of the bottlenecks of our computer (ROM will be massive, like 1000s of tiles). A “false” bit will be a gate which passes the read signal through and the data signal through without affecting either of them. A “true” bit will pass the read and data signals through, but will also output a 1 for the data signal if it receives a read signal. A “true” ROM bit, with data being passed through, and the read signal triggering both outputs. Data wire is top-to-bottom, and read wire is right-to-left. The idea here is to line a bunch of these up, so that a single “read” signal reads out the entire word. By lining up the data wires, we allow for the data from different addresses to be passed down the grid. Okay, so we have the data grid figured out. Next is addressing. Addressing is also done with a grid, but a different kind of grid. We have an address signal (each column receives 1 bit of the address) and a read signal (sent across each row to test that combination of bits for matching). A “false” gate allows the address bit through, but only allows the read signal through if the address bit is 0. A “true” gate allows the address bit through, but only allows the read signal through when the address bit is 1. I created two 1×2 multi-tiles to accomplish this. A “false” address gate. It blocks the read signal when the address bit is 1. 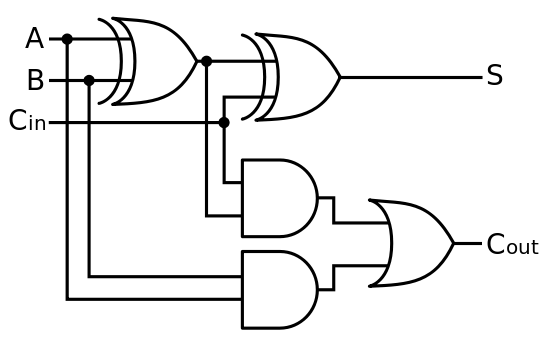 Read signal right-to-left, address bit bottom-to-top. A “true” addressing gate. It allows the read signal through only when the address bit is 1. The basic concept is that we line a lot of these addressing gates side-to-side (sharing the read line), and then the read signal can only get through all of them if the address matches at each bit. Then, that read signal goes on to access the data from that row from the data grid. The addressing gates are stacked vertically so the desired address is tested against each row of gates. So, we have data that is coming off of the data grid in parallel, how to we convert it to serial for use by the computer? It is actually very easy. The data is coming off in parallel, but isn’t synchronized horizontally, since it is produced as the read signal moves right-to-left. It turns out that to convert this to serial, all we have to do is OR the signals left-to-right (in the opposite direction) and the spacing between signals is automatically twice the width of the columns, which is exactly the separation we need. Much more difficult is the serial to parallel conversion we need for addressing. Performing a “true” conversion would be rather difficult, since we have to have timing circuits that are capable of waiting and selecting each bit to move down each wire. It turns out we can cheat. We can send the entire signal down each line, and the read signal for each row will take a “cross-section” of this signal which corresponds to the “correct” value of each bit. There’s a little more to this, though. Since the address signal starts going up each column in right-to-left order, and the read signal also travels in this direction, it would mean that our cross-section is skewed, and it will interact with the same bit (the last bit) of the address all the way across. To correct for this, we slow down the address with a 33:11 delay between each column, so that it enters the next column 33 ticks later instead of 11 ticks. This means that the read signal interacts with the last, then second-to-last, etc., then first bit of the address, which gives us the cross-section we want. ROM. The 4×3 data grid in top-left, 4×2 (physically 4×4) address grid to its right. The read signal travels up the rightmost column. The data is converted to series series in the bottom left, and the address is converted to parallel in the bottom center. As shown, it is set up to read from address 3. The table that represents this ROM is as follows, with data (appears big-endian, but is read off in reverse) on the left and address on the right. The “read” signal that is send alongside the address should be 11 ticks behind (right-to-left) of the last bit in the address. It is possible to send the signal earlier but have delay wire that delays from entering the ROM it until after the address. Return the read signal with the data to indicate when the data has been read. Then, other circuitry needs to be developed that can take data in at variable times and perform the operation once every piece of data is received, whenever that may be. Reverse the order of the data grid, so that the data comes out the opposite side from where the data comes in (as opposed to the same side like above). Then, the data wire will have to come from the far end back to the computer. This effectively slows every read to the same speed. Parallel: A byte of data will be represented as one electron on each of eight separate wires. The wires must be synchronized with each other. Series: A byte of data will be represented as eight electrons on a single wire, carefully timed to indicate where the word begins and ends. Real-world processors of course use parallel data, but they also don’t need to worry much about timings (race conditions are real issues, but they are caused by entirely different reasons). For example, if you are connecting 64 wires from one chip to another, and the outer wire is 5% longer than the inner wire, it doesn’t matter. In cellular automata, the exact distances matter a lot. If we want a 16-bit processor, that’s 16 bulky wires we would have to work around every corner (each of which will either flip their order or put them all out of sync). We would also have to expend additional effort to flip the order of bits or adjust the spacing between wires in order to get the data buses to connect to our circuits. The advantage of parallel data is processor speed (maybe? ), the ability to stick with a more traditional architecture, and the ease of creating memory (maybe). A corner for parallel data, drawn in Logisim. Serial data has the advantage that a change in word size requires a lot less redesign of the hardware. The only important factor is the distance between electrons, which matters for all circuits anyways. Serial-based circuits are also much smaller, since there is simply 1 wire per input stream. The downside is that serial data can sometimes be more clumsy to work with, since, by definition, circuits don’t see the entire word at once. Without a special counter, the circuits can’t tell where words begin or end. Performing “backwards” bitshifts is easy (with delay wire), but performing “forwards” bitshifts is hard (either using diagonal wiring to cut corners, or delaying everything else relative to the selected data). We chose serial data for our project, primarily due to the vastly increased simplicity of wiring. Our decision was made in part by the difficulty of constructing a binary adder. In order to get a better idea of how the computer will end up looking/working, I decided to build something larger and more complex, something that I didn’t know ahead of time how it would work. I chose to build a binary adder. Part of the reason I chose an adder was that the process of binary addition involves “carry over” between bits, which requires interaction between the bits of a number. Most of the other basic operations, like bitwise logic, are significantly simpler to implement. The core of a binary adder is the full adder, which takes in three bits (A, B, and Carry-in) and outputs two bits (Sum and Carry-out). Below is a circuit diagram, but keep in mind that the order of inputs doesn’t matter. 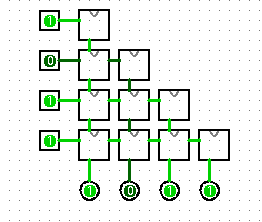 Logic diagram of a full adder. Parallel binary adder. An implementation would require a substantial amount of delay wire. Sometimes, a carry-in wire is connected to the first full adder to allow for 1’s complement subtraction. Without a carry-in wire, the first full adder could be replaced by a half adder. The idea behind a serial adder is much simpler: take a single full adder and loop the carry-out back around to carry-in. In real electronics, this would require a flip-flop to temporarily hold/delay the carry bit, but in our circuits the delay is simply given by the loop of wire. Serial adders, importantly, can only handle little-endian data, meaning that the least significant bit comes first. This means that the binary number 011 refers to the decimal number 6 (rather than a 3 with a leading zero). The creation of a series adder took a reasonable amount of effort, but here was our second working prototype (after a string of failures). The first version was significantly larger. You can see the red corners of the 3×5 tile bounding box. Serial adder, with 101 (5) in the top input and 10111 (29) in the left input. 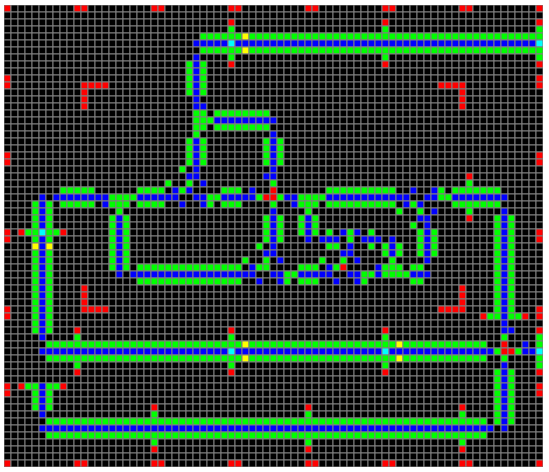 Below is an image showing the flow of information around this adder design. The carry loop is the length-22 loop in the bottom-right of the adder which rotates counter-clockwise, and this loop is packed with an AND, OR, and wire splitter. As information flows into the adder, both inputs are split, with one pair going to an XOR and the other pair going to an AND. The output of the XOR is split, with one half travelling straight to be XORed with the current carry value, resulting in the output value. The other half is ANDed with the carry, which is then ORed with the output of the first AND gate to produce the next value of the carry loop. 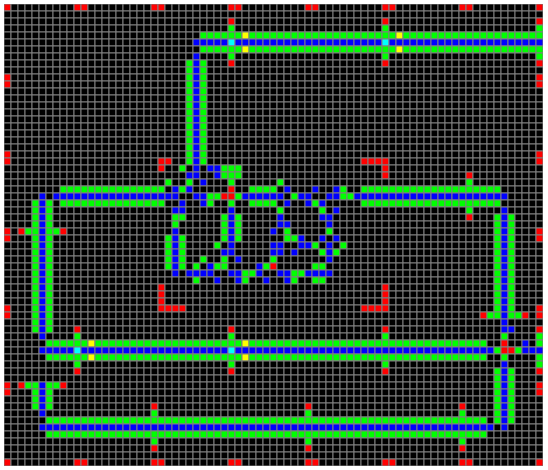 Serial adder with arrows indicating data flow. After an intense round of golfing, the following 2×3 tile design is probably final. It has the exact same connectivity, but the wires have been shortened. Since both designs are “lagless” and “linear,” this more compact version is superior in literally every way. Current best binary serial adder design, shown with inputs of 11 (3) and 011 (6). 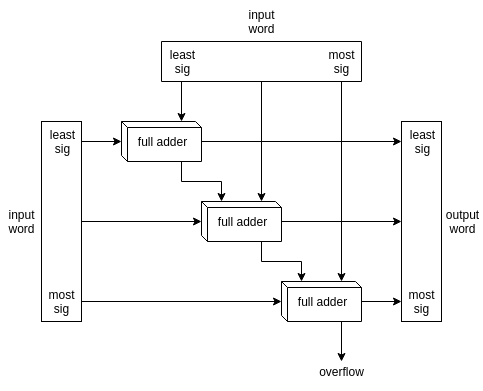 Data flow of compressed adder. It will use serial data (a sequence of electrons on a single wire to represent a word). The spacing between electrons (well, the places where an electron could be) will be 22 ticks. I do have some potential worries about 22-tick technology, though, since it might lead to the creation of a lot more of multi-tile components whenever data needs to flow in a 22-tick loop. Some technology (graphics, global clock, etc.) might still use 11-tick technology. We will probably use 2’s complement, since it does not require us to preset the carry-in of an adder. This might mean, however, that subtraction would be broken down into two steps: negation and addition. We would have a 2’s complement converter/command.